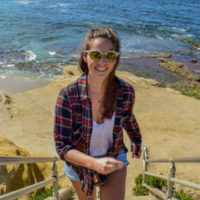 I had traveled over six hours through Belize’s bumpy, unmarked jungle roads to meet a man whose name was on everyone’s lips. I’d seen his sun-bleached photo plastered on clapboard shopfronts, I’d heard his name as I queued for my daily fry jack fix, I’d even read about him between the pages of my Lonely Planet guide. This man was Austin Rodriguez, Central America’s most famous Garifuna drum maker. 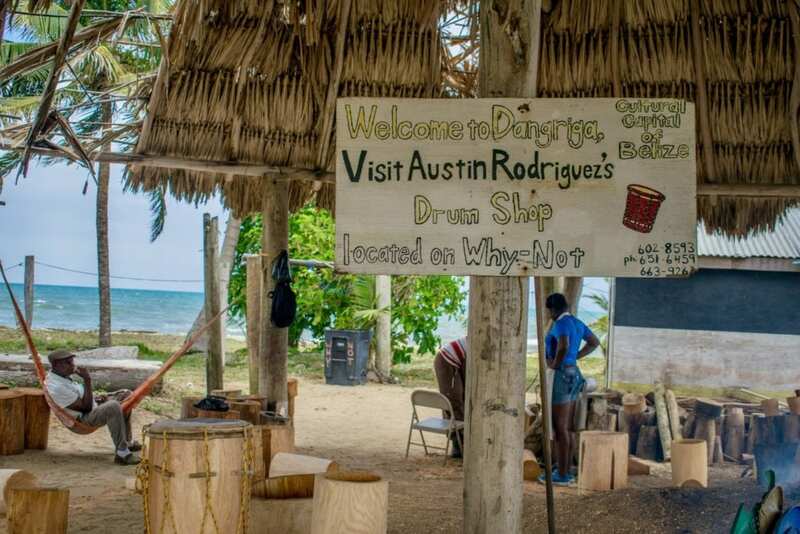 With over 50 years of drum-making experience, Austin is known throughout Belize—and the world—for being one of the most skillful drum makers in history. What I found as I approached his thatched, wall-less seafront workshop, however, wasn’t what I had been expecting. 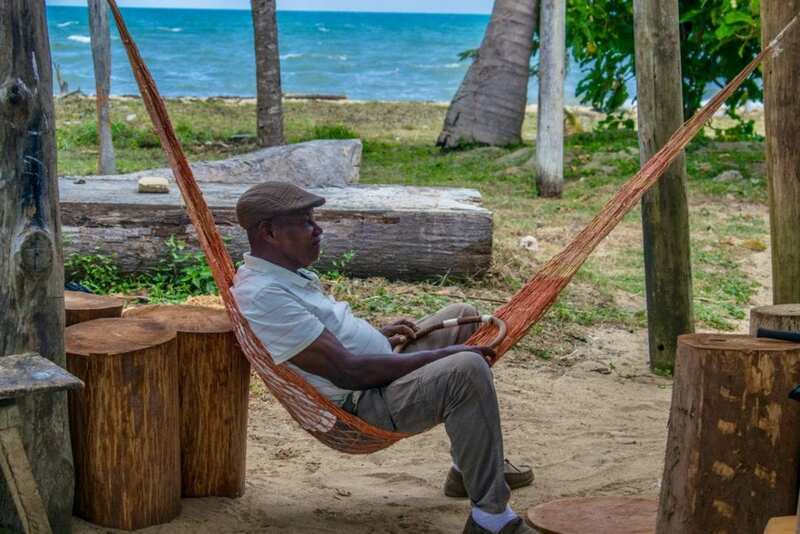 Swinging in his hammock to the sound of the ocean, the legendary self-taught drum maker was indeed there but now, at 89-years-old, it wasn’t Austin Rodriguez behind the chainsaw, it was his daughter, Daytha Rodriguez. The Garifuna—today considered one’s of Belize’s predominant cultures—are descendants of Carib, Arawak, and West Africans. This mixed heritage is attributed to the sinking of a slave ship destined for the New World in 1635, where a group of West Africans escaped and swam to the island of St.Vincent. Here, they were met by Arawak and Carib islanders, who, over centuries of cohabitation and interracial marriage, would soon become one people with a very distinct culture: the Garinagu (plural for Garifuna). Escaping further persecution from European slave merchants and colonialists, by 1832 the Garinagu would flee the island of St.Vincent and land on the shores of Belize (as well as Honduras and Guatemala); a white-sand, blue-sea paradise that they would call home for the next 200 years. It was during this time that many of the Garifuna traditions that we see today, including the important role of drum-making and playing, were formed. Drums—the beating heart of Garifuna culture since West Africans first arrived on the shores of St.Vincent—today act as the strongest connection that modern Garinagu have to their African, Carib, and Arawak ancestry. Steeped in symbolism, the distinct sounds of the Primero (lead) and Segunda (bass) drums are not only at the heart of every celebration, ritual, and ceremony, but they’re also the primary vehicle for Garifuna storytelling, a part of the culture, along with the Garifuna language, that UNESCO warned was in danger of being lost forever back in 2008. The honor of keeping this important facet of Garifuna culture alive has been, for the best part of 400 years, a privilege reserved exclusively for men. Now, in the small, forgotten town of Dangriga, this may—finally—be about to change. I noticed her presence immediately. 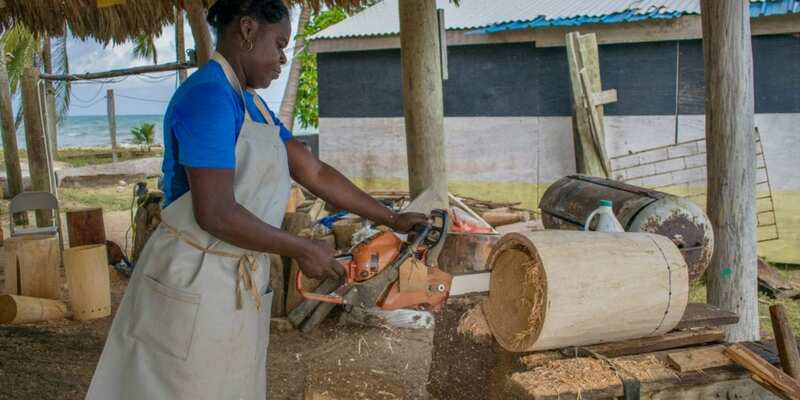 Tall and strong, Daytha was sending thousands of wood chippings flying across the workshop as she effortlessly sliced through thick barrels of mahogany and cedar. No one had noticed that I was standing in the workshop, so I approached Austin in his hammock and asked if I could speak to him about the drum-making process. “I don’t make the drums anymore”, he replied pointing over to the woman by the chainsaw, “my daughter, Daytha, does.” A little disappointed at Austin’s short reply (I had, after all, traveled all this way to meet the legend himself), I shuffled over awkwardly to where Daytha was working. Once she saw me, she smiled warmly, wiped the sawdust from her face, and switched off the chainsaw. When she showed her dad, Austin smiled. “I knew you could do it, Daytha. If I’d said yes, you would have asked me to do it tomorrow, and again the next day. 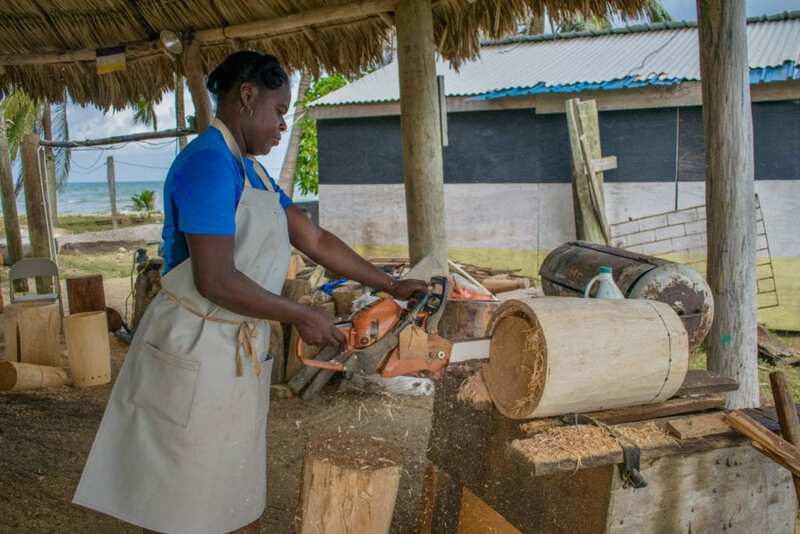 And again the next.” Almost three decades later, Daytha—with the help of her sister and son—now produces the vast majority of Belize’s, Honduras and Guatemala’s Garifuna drums, and has exported as far as the US, Canada, and even Europe. 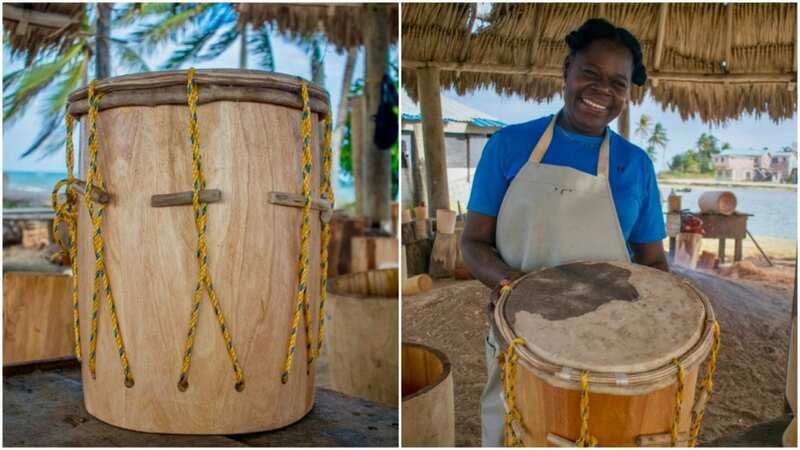 While it is her father’s name that still remains on every Belizean storefront and international guidebook, the truth is that it is Daytha—Belize’s first female master drum maker—who has been quietly keeping the Garifuna drum tradition alive. 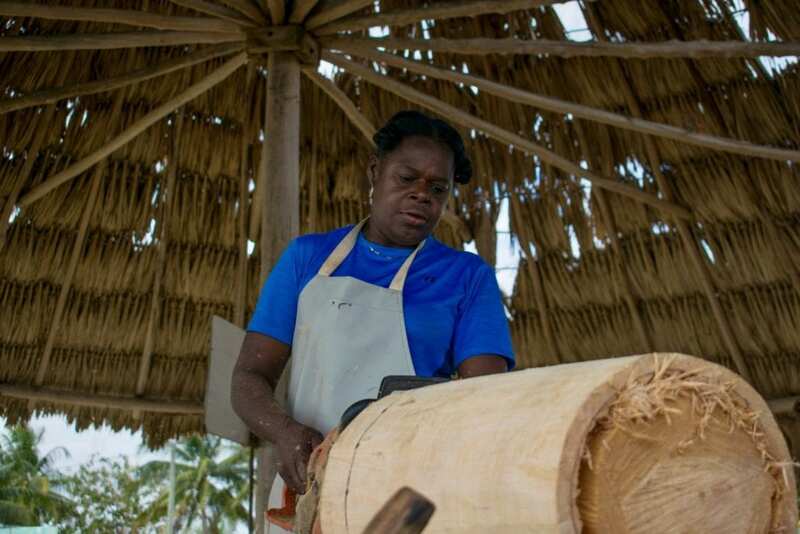 This is a story of a woman who is striving to maintain a famous family legacy while carving the way for a new Garifuna era: one where strong, courageous, and determined women play a far more central role.